Earlier this summer Target announced it was introducing a slew of new brands and discontinuing some that have seen better days - hello Goodfellow & Co, au revoir Mossimo. As a Manhattanite, Target occupies a place in my mind as a spot where lucky suburbanites shop for laundry detergent and juice and soda - all the things that are too heavy for a city-dweller to carry - and load them into the car before driving home to their giant houses with giant closets and an actual backyard. But does Target offer compelling fashion choices? 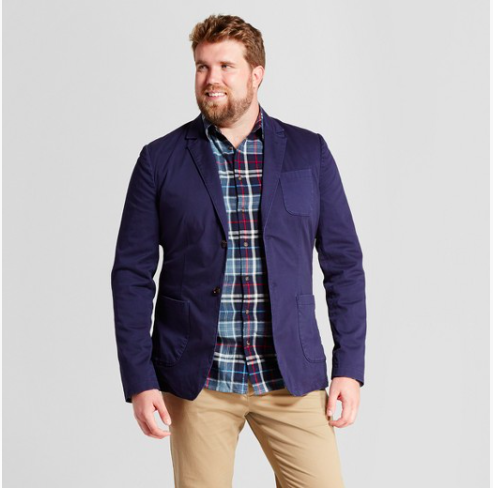 I browsed their Big & Tall selection online, and these are the things that are in my cart. I will wear horizontal stripes and you can't stop me. I picture this with some white jeans for an (almost) red, white, and blue look. I've been looking for the perfect "soft blazer" since Jamba Juice was the latest food craze sweeping the nation. Have I found it? I'd ditch the rumpled plaid shirt for a crisp oxford shirt and a preppy repp-stripe tie. You heard it here third: cargos are back! I'd wear these rolled up with a Weejun (12E) and a grey cashmere crewneck for a look that's about as close to Brunello Cucinelli as I'm going to get without a giant cardboard check being presented to me at a press conference. I'm all over this sweater (but only in the heather grey, I'm not a monster!). My fall look? This, paired with crisp dark denim and a scowl.